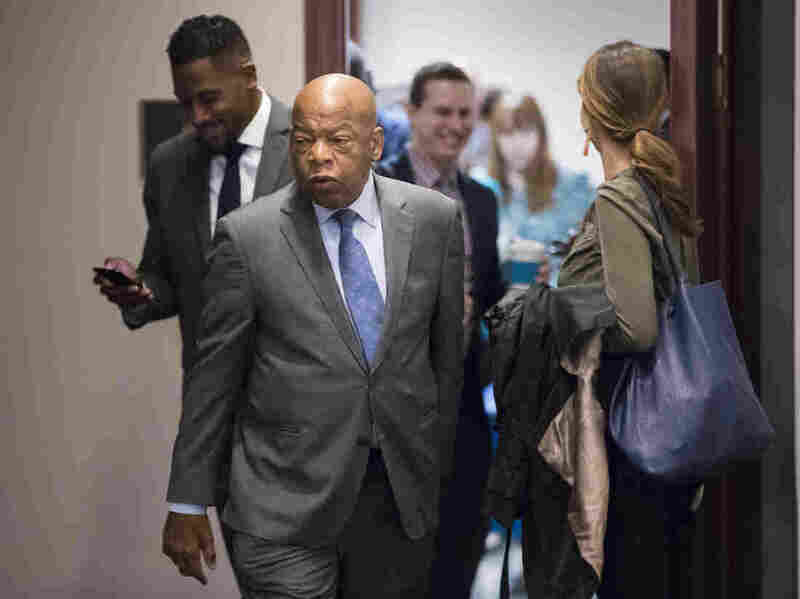 African-American Congressmen Will Skip Mississippi Civil Rights Event To Avoid Trump : The Two-Way The congressmen say that given the president's record, he is ill-suited to attending the opening of a Mississippi museum dedicated to the history of civil rights. Rep. John Lewis, D-Ga., says he'll skip the opening of a Mississippi civil rights museum because President Trump is scheduled to attend. "President Trump's attendance and his hurtful policies are an insult to the people portrayed in this civil rights museum. The struggles represented in this museum exemplify the truth of what really happened in Mississippi. President Trump's disparaging comments about women, the disabled, immigrants, and National Football League players disrespect the efforts of Fannie Lou Hamer, Aaron Henry, Medgar Evers, Robert Clark, James Chaney, Andrew Goodman, Michael Schwerner, and countless others who have given their all for Mississippi to be a better place." Soon thereafter, former Navy Secretary Ray Maybus, who is white, tweeted that he would not attend the museum opening either, citing Trump's planned speech. "His support of white supremacists and racism exact opposite of what museum is about," said Maybus, a former Democratic governor of Mississippi. Trump was invited to speak at the ceremony marking the bicentennial of Mississippi's admission to the union by Republican Gov. Phil Bryant, who criticized Trump's detractors. "We are better than that. We are kinder and more tolerant here in Mississippi than I think perhaps other places. Allow the president to come and honor Mississippi with his speech and his presence," said Bryant as quoted by the AP. The event will showcase two museums sharing the same roof in downtown Jackson. One is the Museum of Mississippi History and the other is the Mississippi Civil Rights Museum. The latter is the only state-sponsored civil rights museum in the nation. Lewis was to have been one of the main speakers at the event along with Myrlie Evers, the widow of assassinated Mississippi NAACP leader Medgar Evers. She told the New York Times she hopes that Trump will "learn something" by attending the museum opening. "If God gives me the breath and the strength, I will address his attendance when I stand to speak," she added.